Have you found an online vendor selling Vizcaya Cristal? Oliver & Oliver know rum and if you drink this, you will too. Seriously do some research and you'll know what I mean since the bottle only says "Cuban formula rum" and not much else, but it really doesn't need to. Made from the original pre-revolution Cuban formula and distilled in the Dominican Republic where the environment is damn near identical. The initial aroma warms your nostrils and the taste is so smooth and warm that this one can be drank neat. This rum is made straight from sugarcane and not molasses like most of the others in this category, but dear lord, you can taste the difference. The best you can get with white rum, hands down. This surpassed the Diplomatico Blanco as my favorite light rum (though I've since discovered the Banks 5 Island to be my favorite light rum). Even sweeter and smoother than Diplomatico, this has very nice notes of vanilla, sugarcane, and marshmallow. A great sipping rum! I prefer aged rum to light rum, however; hence my score isn't as high as many of the aged rums I've reviewed. But an exceptional light rum, nonetheless! A white rum with charisma you say? Say it ain't so... Ah, but it is so!! Nose offers vanilla and marshmallow, with a bit of yellow fruit underneath. Thick entry, which is really weird to say for a white rum, but Vizcaya manages somehow. This potent little bugger comes along remarkably like vanilla ice cream, but with a certain grassiness in there. Not much, certainly far from agricole, but enough to stop this rum from being boring. On the finish you get that light vanilla bean, plus a bit of alcohol presence finally making itself known. Still, for a white rum, this is EASILY my favorite thus far! And for what this rum is, it's a complete steal at 25-30$ a bottle! Pick it up when you get the chance!! This is by far the best white rum available! The aroma was slightly sweet, and it was very clean on the palate. It's a shame that more people don't carry it. Only white I can label as sipping quality. This is an exceptional white rum that tasted blind will pass for any aged rum. Scents of Vanilla and species with some chocolate. Very smooth in the palate and no alcohol afterburn. Maybe a little too sweet but still very enjoyable A white to be sipped neat. A 9 in comparison with other white rums. I had a few drinks of Vizcaya Cristal while vacationing in Oaxaca Mexico. Pretty decent bottle and label design. Very strong alcohol to the nose and palate if neat sipped. Mixes rather well with your favorite soda drinks though. Body: Starts smooth and increases in intensity. Vanilla and white sugar again. Very sweet follow by a gentle bitterness. Very good and intense, but not very complex. Nevertheless some good stuff. It's no joke that this is one of the better white rums.. Period. While I see that it's listed here at about $30.00, I was able to purchase it for $18.00. From my understanding it is not a big seller her. Much to my surprise. With a crisp taste that goes down with a slight burn. It's quite invigorating. I usually shy away from the white rums, but saw this at a small liquor store and it was the only one I had not tried before. While a little strong over ice, when mixed with coke it certainly worked for me. At first sniff, this white rum doesn’t seem like a white rum! This is smooth and delightful! Loadd with character. I would like to thank fellow reviewer "james Ford" for his 10-star review to inspire me. So why the lingering doubt? I already had found enough of the perfect white rum mixers and nothing could top Plantation 3-Star Artisinal for a white sipping rum. Until now!!!! I first did a side by side taste test against Matusalem Platino, since both are from the Dominican Republic and I have rated the Matusalem fairly high at a 6. No contest! The Vizcaya Cristal actually makes Matusalem Platino taste medicinal when compared. Instead, Vizcaya Cristal has no repulsive aroma or taste, but has an absolutely wonderful aftertaste that is different each time! Chocolate one time and vanilla another, then cinnamon. How on earth do they do it? Original Cuban Formula! I just had to compare this side by side to my only other white rum worthy as a sipper, Plantation 3-Star Artisinal. I will rate Vizcaya Cristal as a 7 equally with the Plantation. Both are fantastic sipping white rums at the top of their class, but not quite up to the level of their darker competitors. Basically, if you want tropical fruit flavors, pick the Plantation. 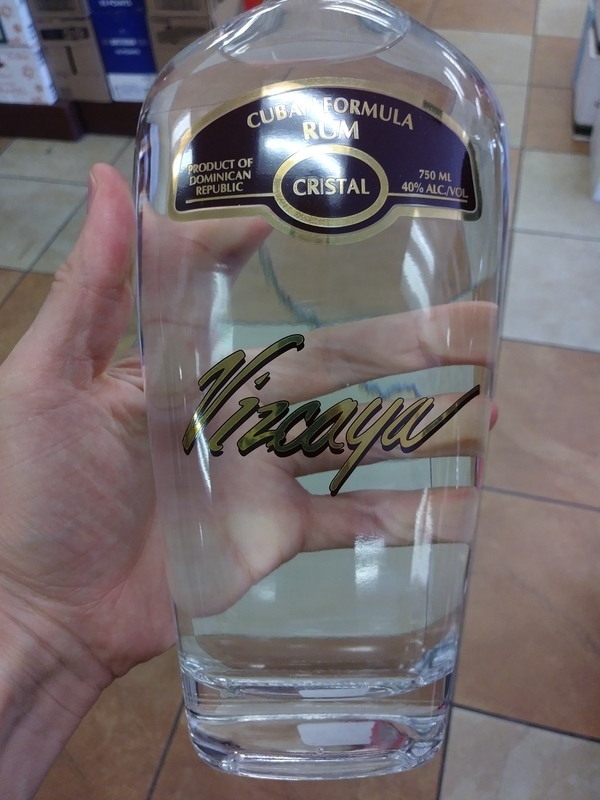 If you want chocolate, vanilla, cinnamon, and other surprises, pick this Vizcaya Cristal. Update: See my review on Koloa Toasted Coconut Rum for a great drink recipe that also uses this one! It's proper aged rum, color was filtered out and there we have gentle rum with a lot of flavours. Vanilla for example. Or vanilla. And... Perfect smooth mixer. Always happy to see this on the shelf. Never mixed it and have no idea why anyone would want to dilute the way it sits on your tongue. Good white rum for mixing lots of vanilla flavor. Taste straight is a little like turpentine. Despite being a white rum this could be enjoyed on the rocks. The rum has been aged in barrels and the colors removed by filters. A lot of fruitiness in the flavour. Rating is compared to other white rums. This Vizcaya rum is much sweeter than the other two. Good on rocks and great mixer.